"Moonie" redirects here. For other uses, see Moonie (disambiguation). 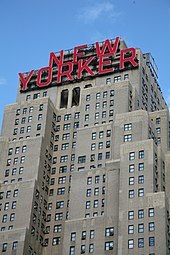 The New Yorker Hotel, purchased by the Unification Church of the United States in 1976 and now the site of national church headquarters offices. The Unification Church of the United States, sometimes colloquially referred to as the "Moonies", is a new religious movement in the United States of America. It began in the 1950s and 1960s when missionaries from Japan and South Korea were sent to the United States by the international Unification Church's founder and leader Sun Myung Moon. It expanded in the 1970s and then became involved in controversy due to its theology, its political activism, and the lifestyle of its members. Since then it has been involved in many areas of American society and has established businesses, news media, projects in education and the arts as well as taking part in political and social activism, and has itself gone through substantial changes. In the late 1950s and early 1960s missionaries from the Holy Spirit Association for the Unification of World Christianity (HSA-UWC) of South Korea and Japan came to the United States. Among them were Young Oon Kim, Sang Ik-Choi, Bo Hi Pak, David S. C. Kim, and Yun Soo Lim. Missionary work took place in Washington D.C., New York, Oregon, and California. The Unification Church first came to public notice in the United States after sociology student John Lofland studied Young Oon Kim's group and published his findings as a doctoral thesis entitled: The World Savers: A Field Study of Cult Processes, which was published in 1966 in book form by Prentice-Hall as Doomsday Cult: A Study of Conversion, Proselytization, and Maintenance of Faith. This book is considered to be one of the most important and widely cited studies of the process of religious conversion, and one of the first modern sociological studies of a new religious movement. In 1965 Moon visited the United States and established what he called "holy grounds" in each of the 48 contiguous states. By 1971 the Unification Church of the United States had about 500 members. By the end of the 1970s it had expanded to about 5,000 members, with most of them being in their early 20s. In the 1980s and 1990s membership remained at about the same number. Scholars have attributed the Unification Church's relative success in the United States, as compared to other Western nations, to its support of patriotism and capitalist values, and to its multi-racial membership. Some commentators have also noted that this period of Unification Church growth in the United States took place just as the "hippie" era of the late 1960s and early 1970s was ending, when many American young people were looking for a sense of higher purpose or community in their lives. Among the converts were many who had been active in leftist causes. In 1971 Moon decided to move to the United States. He then asked church members to help him in a series of outreach campaigns in which he spoke to public audiences in all 50 states, ending with a 1976 rally in Washington D.C. in which he spoke on the grounds of the Washington Monument to around 300,000 people. During this time many church members left school and careers to devote their full-time to church work. Mobile fundraising teams were set up to raise money for church projects, often giving candy or flowers in exchange for donations. Moon also brought members from Europe and Japan to work in the United States. Church buildings were purchased around the nation. In New York State the Belvedere Estate, the Unification Theological Seminary, and the New Yorker Hotel were purchased. The national headquarters of the church was established in New York City. In Washington D.C. the church purchased a church building from The Church of Jesus Christ of Latter-day Saints, and in Seattle the historic Rolland Denny mansion. Moon had long been an advocate for anti-communism. He was born in what is now North Korea and had been imprisoned by the North Korean communist government during the Korean War, and believed that the defeat of communism by democracy was a necessary step in the Divine Providence to establish the Kingdom of God on earth. In 1974 Moon asked church members to support President Richard Nixon during the Watergate scandal when Nixon was being pressured to resign his office. Church members prayed and fasted in support of Nixon for three days in front of the United States Capitol, under the motto: "Forgive, Love and Unite." On February 1, 1974 Nixon publicly thanked them for their support and officially received Moon. This brought the church into widespread public and media attention. The Unification Church of the United States sponsored other anti-communist activities during the 1970s and 1980s, including the multi-national organization CAUSA International. In 1982 Moon founded the conservative newspaper The Washington Times, in Washington D.C., as part of News World Communications, an international news media conglomerate which also publishes newspapers in South Korea, Japan, and South America. Although never a financial success, the Times was well-read in conservative and anti-communist circles and was credited by President Ronald Reagan with helping to win the Cold War. In 1983 church members publicly protested against the Soviet Union over its shooting down of Korean Airlines Flight 007. In 1984, church member Dan Fefferman founded the International Coalition for Religious Freedom in Virginia, which is active in protesting what it considers to be threats to religious freedom by governmental agencies. In 1986 conservative author William Rusher wrote: "The members the Reverend Sun Myung Moon's Unification Church, now almost universally referred to as 'Moonies,' constitute a fascinating problem for outsiders--and perhaps above all for conservatives, because they are so unabashedly anti-Communist and pro-American." The Unification Church of the United States was met with widespread criticism beginning in the early 1970s. The main points of criticism were the church's unorthodox theology, especially the belief that Moon is the second coming of Christ; the church's political involvement; and the extreme lifestyle of most members, which involved full-time dedication to church activities often at the neglect of family, school, and career. During this time, hundreds of parents of members used the services of deprogrammers to remove their children from church membership and the activities of the church were widely reported in the media, most often in a negative light. In 1975 Steven Hassan left the church and later became an outspoken critic. He is the author of two books on his experiences and his theories on cult mind control. The political activities of the church were opposed by some leftists. In 1976 members of the Youth International Party staged a marijuana "smoke-in" in the middle of a UC sponsored rally in Washington D.C. In 1976 church president Neil Albert Salonen met with Senator Bob Dole to defend the Unification Church against charges made by its critics, including parents of some members. In 1977, church member Jonathan Wells, who later became well known as the author of the popular Intelligent Design book Icons of Evolution, defended Unification Church theology against what he said were unfair criticisms by the National Council of Churches. That same year Frederick Sontag, a professor of philosophy at Pomona College and a minister in the United Church of Christ, published Sun Myung Moon and the Unification Church which gave an overview of the church and urged Christians to take it more seriously. In an interview with UPI Sontag compared the Unification Church with The Church of Jesus Christ of Latter-day Saints and said that he expected its practices to conform more to mainstream American society as its members become more mature. He added that he did not want to be considered an apologist for the church but a close look at its theology is important: "They raise some incredibly interesting issues." In 1978 and 1979, the church's support for the South Korean government was investigated by a Congressional subcommittee led by Democratic Representative Donald M. Fraser of Minnesota. (see also: Koreagate, Fraser Committee) In 1982 the United States Supreme Court struck down a Minnesota law which had imposed registration and reporting requirements on those religions that receive more than half of their contributions from nonmembers as being contrary to the First Amendment of the United States Constitution's protection of religious freedom and prohibition of state establishment of religion. The law was seen as especially targeting the Unification Church. In the 1970s the American news media began using the word "Moonie" to refer to Unification Church members. This was widely considered to be derogatory. In the 1980s and 1990s the church undertook an extensive public relations campaign against the use of the word by the news media. In 1989 the Chicago Tribune was picketed after referring to members as "Moonies". Minister and civil rights leader James Bevel handed out fliers at the protest which said: "Are the Moonies our new niggers?" On an October 6, 1994 broadcast of Nightline, host Ted Koppel stated: "On last night's program ...I used the term 'Moonies'. This is a label which members of the Reverend Sun Myung Moon's Unification Church find demeaning and offensive, and I'd like to apologize for its use." Journalistic authorities, including the New York Times and Reuters, now discourage its use in news reporting. On July 1, 1982 a large number of the members of the Unification Church of the United States were married by Rev. and Mrs. Moon in a Blessing ceremony (sometimes called a "mass wedding") in Madison Square Garden in New York City. The total number of couples who took part was 2075, some coming from other countries. Soon after other American members were married in ceremonies in South Korea. Most who took part were matched with their future spouses by Moon. Many couples were international or interracial. Before this most American church members had been single and living celibately. Moon's practice of matching couples was very unusual in both Christian tradition and in modern Western culture and attracted much attention and controversy. Thousands of couples have been placed in marriages by religious leaders with people they had barely met, since Moon taught that romantic love led to sexual promiscuity. Their mass arranged marriage events have gained international public attention. Critics have stated that some of these marriages end in divorce, which is discouraged by the church. Also in the 1980s Moon instructed church members to take part in a program called "Home Church" in which they reached out to neighbors and community members through public service. Unification Church business interests, which had begun in the 1960s, expanded in the 1980s, 1990s, and 2000s (decade). Church owned businesses in the United States include media and entertainment, fishing and sea food distribution, hotels and real estate, and many others. Many church members found employment in church owned businesses while others pursued careers outside of the church community. Also expanding were church sponsored interdenominational and cultural projects. In 1984 Eileen Barker, a British sociologist specializing in religious topics, published The Making of a Moonie: Choice or Brainwashing? which disputed much of the negative characterization of church members by the news media. In 1991 Inquisition: The Persecution and Prosecution of the Reverend Sun Myung Moon by investigative journalist Carlton Sherwood criticized the federal government's prosecution of Moon in the 1980s. After the dissolution of the Soviet Union in 1991, Moon made anti-communism much less of a priority for church members. In that year Moon announced that members should return to their hometowns in order to undertake apostolic work there. Massimo Introvigne, who has studied the Unification Church and other new religious movements, has said that this confirms that full-time membership is no longer considered crucial to church members. In 1997 Dr. Sontag commented: "There's no question their numbers are way down. The older members complain to me that they have a lot of captains but no foot soldiers." While Dr. Barker reported that Unificationists had undergone a transformation in their world view from millennialism to utopianism. On May 1, 1994 (the 40th anniversary of the founding of the Holy Spirit Association for the Unification of World Christianity (HSA-UWC) in Seoul, South Korea), Moon declared that the era of the HSA-UWC had ended and inaugurated a new organization: the Family Federation for World Peace and Unification (FFWPU). The FFWPU would include members of various religious organizations working toward common goals, especially on issues of sexual morality and reconciliation between people of different religions, nations, and races. The FFWPU co-sponsored the Million Family March in 2000, the Global Peace Festival in the late 2000s (decade), and blessing ceremonies in which thousands of married couples of different faith backgrounds were given the marriage blessing previously given only to HSA-UWC members. In 2009 Sun Myung Moon's daughter In Jin Moon became president of the FFWPU of the United States. She worked to modernise FFWPU's worship style in an effort to involve younger members. In 2014 FFWPU sponsored a 43-day bus tour of the United States for its members which included visits to each of Moon's original holy grounds. In 2015 it opened a conference center in Las Vegas, Nevada. In 2016 a study sponsored by the Unification Theological Seminary found that American FFWPU members were divided in their choices in the 2016 United States presidential election, with the largest bloc supporting Senator Bernie Sanders. In 2001 the United States Army, in a handbook for chaplains, reported that the Holy Spirit Association for the Unification of World Christianity emphasizes the responsibility of citizenship but sets no official rules as to military service." It added that HSA-UWC members have no restrictions on diet, uniform appearance, medical treatment, or other factors which might conflict with military requirements. The Unification Church of the United States has introduced a number of neologisms into the English language, directly or indirectly. These include the derogatory term "Moonies", a special use of the word "indemnity", and the expressions "True Parents", "heartistic", "doomsday cult", "love bombing", and "crazy for God"—the last coined by Moon himself. ^ A History of the Unification Church in America, 1959–1974: Emergence of a National Movement, Michael L. Mickler, 1987, New York: Garland, ISBN 0-8153-1138-9. ^ Melton, J. Gordon & Moore, Robert L. The Cult Experience: Responding to the New Religious Pluralism. New York: The Pilgrim Press (1984 [3rd printing; 1st printing 1982]); pg. 8. "...audiences are surprised to learn that the Unification Church has less than 5,000 members in the U.S., because the press often gives the impression of far larger numbers." Melton is a leading expert on new religious movements. ^ Finke, Roger & Stark, Rodney. The Churching of America, 1776–1990. New Brunswick, NJ: Rutgers University Press (1992; 3rd printing 1997); pg. 241. "...after more than thirty years of missionizing, it is estimated that there have never been more than 5,000 followers of the Unification Church... in the United States, some of whom are from abroad." ^ The Market for Martyrs, Laurence Iannaccone, George Mason University, 2006, "One of the most comprehensive and influential studies was The Making of a Moonie: Choice or Brainwashing? by Eileen Barker (1984). Barker could find no evidence that Moonie recruits were ever kidnapped, confined, or coerced. Participants at Moonie retreats were not deprived of sleep; the lectures were not "trance-inducing"; and there was not much chanting, no drugs or alcohol, and little that could be termed "frenzy" or "ecstatic" experience. People were free to leave, and leave they did. Barker's extensive enumerations showed that among the recruits who went so far as to attend two-day retreats (claimed to be the Moonie's most effective means of "brainwashing"), fewer than 25% joined the group formore than a week and only 5% remained full-time members one year later. And, of course, most contacts dropped out before attending a retreat. Of all those who visited a Moonie centre at least once, not one in two-hundred remained in the movement two years later. With failure rates exceeding 99.5%, it comes as no surprise that full-time Moonie membership in the U.S. never exceeded a few thousand. And this was one of the most successful New Religious Movements of the era!" ^ Korean Moon: Waxing of Waning?, Leo Sandon Jr., Theology Today, Vol 35, No 2, July 1978, "Thousands of young American adults (probably 3,000-5,000) have joined the Unification Church. Many of these members are attractive, well-educated graduates from some of our finest colleges and universities. Their membership in the movement should remind us that for the young adult (18–25 years of age) conversion has a highly ideological and vocational dimension." ^ a b Moon at Twilight Archived 2001-04-11 at the Wayback Machine, The New Yorker September 14, 1998, "David Bromley, a professor of sociology and religious studies at Virginia Commonwealth University, who has co-written a book about the Unification Church, believes that the bulk of Moon's remaining followers were recruited in the seventies, when both the establishment and the counterculture were falling apart. Bromley says that the sense of joining a close, purposeful community was crucial, and that it is no coincidence that church members refer to each other as "brother" and "sister" or that Moon is called Father." ^ Moon-struck, Time, October 15, 1973, "The core members—most in their 20s, many of them converts from other spiritual, psychological or political trips—display a dogged devotion that makes even Jehovah's Witnesses look like backsliders. They are enthusiastic capitalists who rise at dawn to hit the streets with wares to exchange for "donations": flowers, votive light candles, even peanuts. Last year, when Master Moon moved his international headquarters to Tarrytown, N.Y., members sold candles across the U.S. for seven weeks to meet the down payment of $300,000 on an $850,000 estate." ^ Wakin, Daniel J. (2012-09-02). "Rev. Sun Myung Moon, 92, Unification Church Founder, Dies". The New York Times. ISSN 0362-4331. Retrieved 2013-01-02. ^ Woo, Elaine (2012-09-03). "Sun Myung Moon dies at 92; led controversial Unification Church". Los Angeles Times. ISSN 0458-3035. Retrieved 2013-01-02. ^ Brown, Emma (2012-09-04). "Sun Myung Moon dies at 92; Washington Times owner led the Unification Church". The Washington Post. ISSN 0190-8286. Retrieved 2013-01-02. ^  Divine Principle, Introduction. "Nonetheless, one final and inescapable conflict remains before us, the war between democracy and communism. Although each side has equipped itself with fearsome weapons and is pitted against the other in readiness for battle, the core of their conflict is internal and ideological. Which side will triumph in this final ideological conflict? Anyone who believes in the reality of God will surely answer that democracy will win." ^ Beyond the Dark Side of the Moonies, Andrew Brown, The Independent, November 2, 1995, "The Moonies were - and remain - intent on halting communism. Moon founded the Holy Spirit Association for the Unification of World Christianity in Korea in 1954. The first missionaries were sent out in the Fifties, but only after Moon moved to the US in the Seventies did the movement start to become visible in the West. Moon's followers believe he is the Messiah who can lead the way to establishing the Kingdom of Heaven on Earth. Their beliefs are set out in the Divine Principle, which contains interpretations of the Old and New Testaments with further revelations from Moon himself. Devotees believe God's victory over Satan requires the defeat of atheistic communism. To this end they have sponsored large numbers of conferences for journalists, theologians, academics, politicians and anyone else they think might contribute to establishing a God-centred world." ^  San Francisco Chronicle September 3, 1983 "For a second day, the Soviet Consulate in Pacific Heights was the scene of emotional protests against the shooting down of a Korean Air Lines jumbo jet. About 300 people held demonstration yesterday morning. Among them were members of the Unification Church, or "Moonies," whose founder is the Rev. Sun Myung Moon, the controversial South Korean who has melded a fierce anti-communism into his ideology. Eldridge Cleaver, the onetime black radical who recently has had ties with the Moonies, spoke at the rally. Many pickets carried signs accusing the Soviet Union of murdering the 269 passengers and crew aboard the airliner. In another development, San Francisco attorney Melvin Belli filed a $109 billion lawsuit against the Soviet Union on behalf of the 269 victims." ^ Ribadeneira, Diego (August 21, 1999). "Ire at school Star of David ruling unites ACLU, Pat Robertson". The Boston Globe. The New York Times Company. p. B2. ^ Review of The Making of a Moonie, William Rusher, National Review, December 19, 1986. ^ Sontag, Frederick, Sun Myung Moon and the Unification Church, (Abingdon Press, 1977; Korean translation, Pacific Publishing Company, 1981; Japanese translation, Tuttle-Mori Agency, Inc., 1977; German translation, SINUS-Verlag, Krefeld, 1981) ISBN 0-687-40622-6"
^ Why Are Pastors Flying to Moon? Christianity Today August 1, 2001. ^ Church urges Christian unity: Valley seminary open since 1975 Poughkeepsie Journal, 2003-12-11"Michael Tori, a professor in Marist College's religious studies program, said the Unification Church has gained more acceptance in mainstream society for several reasons. One reason was Rev. Moon's indictment in the early 1980s for tax evasion. The indictment showed Moon was financially accountable to the government and to the public, Tori said. Another reason the church has gained greater acceptance is that it has taken on several universally accepted causes such as the importance of family values in society and the formation of the Interreligious and International Peace Council. The church has also given financial support to institutions such as the University of Bridgeport in Connecticut and made acquisitions such as the purchase of the Washington Times." ^ PacNews staff (February 17, 2006). "Church leaders unite against Moonies". PacNews. Pacific Island News Agency Service. ^ Gorenfeld, John (2008). Bad Moon Rising. PoliPointPress. p. 96. ISBN 0-9794822-3-2. ^ Ayoob, Massad (November–December 2001). "The Rise of the House of Kahr". American Handgunner: 58–67. ^ Zagoria, Sam (September 19, 1984). "Journalism's Three Sins". The Washington Post. The Washington Post Company. p. A26. ^ Goldman, Ari L. (July 28, 1985). "Moon's jailing may have eased things for his flock". The New York Times. The New York Times Company. Section 4; Page 7, Column 4. ^ Taylor, John G. (September 1, 1990). "Unification Church will keep eye on media". The Fresno Bee. p. A10. ^ Helvarg, David (2004). The War Against the Greens. Johnson Books. p. 211. ISBN 1-55566-328-1. ^ a b Hatch, Walter (February 13, 1989). "Big names lend luster to group's causes - Church leader gains legitimacy among U.S. conservatives". The Seattle Times. Seattle Times Company. p. A1. ^ Koppel, Ted (October 6, 1994). "Transcript # 3489". Nightline. ABC News. ^ Siegal, Allan M.; William G. Connolly (2002). The New York Times Manual of Style and Usage. Three Rivers Press. p. 344. ISBN 978-0-8129-6389-2. ^ "Thousands marry in first Moonie wedding since founder's death". Independent. 17 February 2013. Retrieved 20 May 2017. ^ Palmer, Mark (6 September 2012). "I got married in a Moonie mass wedding: He was a public schoolboy from a wealthy family. So what made Mark Palmer spend seven years as a disciple of the cult?". Daily Mail. Retrieved 20 May 2017. ^ Henneberger, Melinda (22 December 1992). "A Look at Life After Mass Marriage; For 2,075 Couples (Give or Take 200), 10 Years Together, Thanks to Sun Myung Moon". The New York Times. Retrieved 20 May 2017. ^ Despite controversy, Moon and his church moving into mainstream Archived 2008-07-25 at the Wayback Machine Chicago Tribune, April 11, 2006. "Derided as a cult in the 1970s and '80s that aggressively recruited young people to sell flowers in airports, the church changed its emphasis a decade ago to forming alliances with other faiths around issues such as abstinence and resistance to gay marriage." ^ Barker, Eileen, The Making of a Moonie: Choice or Brainwashing? (1984) Blackwell Publishers, Oxford, UK ISBN 0-631-13246-5. ^ Tingle, D. and Fordyce, R. 1979, The Phases and Faces of the Moon: A Critical Examination of the Unification Church and Its Principles, Hicksville, New York: Exposition Press p53-55 "In short, indemnity is anything you want to make it, since you establish the conditions. The zeal and enthusiasm of the Unification Church members is not so much based on love for God as it is compulsion to indemnify one's own sins." ^ THE POWER OF THE PRINCIPLE: WHENCE IT CAME; WHERE IT WENT Richard Quebedeaux, "Rev. Moon calls such a mode of living, such a lifestyle, "restoration through indemnity." With indemnity viewed as a persistent pattern of behavior, not as a mere doctrine to be affirmed or a rational list of rules, God's ideal for human relationships is "restored" through restitution. Restitution-in the sense of a "natural law"-assuages resentment, because it is the means by which the powerful and enfranchised give the people who feel downtrodden and powerless what they believe is rightly theirs. Indemnity means that "I'm here for you." ^ Moon At Twilight: Amid scandal, the Unification Church has a strange new mission, Peter Maass New Yorker Magazine, September 14, 1998. "Moon sees the essence of his own mission as completing the one given to Jesus - establishing a 'true family' untouched by Satan while teaching all people to lead a God-centered life under his spiritual leadership." ^ Unifying or Dividing? Sun Myung Moon and the Origins of the Unification Church, by George D. Chryssides, University of Wolverhampton, U.K. A paper presented at the CESNUR 2003 Conference, Vilnius, Lithuania. ^ The Way of God's Will: Witnessing, Sun Myung Moon, "Witnessing should be preceded by heart; to witness you should have so strong an emotion that you become a heartistic magnet who can draw the minds of all." ^ The Way of God's Will: Blessing, Sun Myung Moon, "These are the internal, heartistic stages which we must go through." ^ The Way of God's Will Chapter 3. Leaders, "We leaders should leave the tradition that we have become crazy for God." The Moonie Family, Leo Sandon Jr., 1978, Worldview Magazine, published by the Carnegie Council. Tahoe Boy, autobiography of Pat Hickey, an early church member. This page was last edited on 28 December 2018, at 05:21 (UTC).